Dar's By Design - All The Frogs! Frog Checkers. Please give it a try and let us know what you think. Click_Here to play. Concentration - It's not totally frog related, but there is a frog involved. Click_Here to play. Tetris - Okay, we admit it has absolutely nothing to do with frogs, but we still love the Tetris Game. Click_Here to play. Free Desktop Frog Wallpaper created with Debbie Orlean's Photos. With gratitude to Royce B. McClure for allowing us to share, we present his Frog Artwork. Our Aspiring Artists... under the age of 18... Frog Art. These are my own meager Frog Creations. I haven't added any in years, but can't bring myself to do away with them. You'll find a frog or two Here, on our Animation Page. Animated gifs are pretty much a thing of the past, but we still can't bring ourselves to throw them away. Last, but not least, our Links Page which includes links to the best frog sites we could locate. We don't list all, only the best (in our opinion). Offered on other pages, but we promised you, on this page, all the frogs on the web site. Frog In A Blender compliments of AtomFilms.com -- Click_Here to download the zip file. 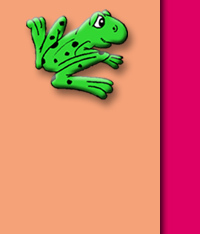 FrogPult, an old game that appears to still work on Windows XP -- Click_Here to download the zip file.